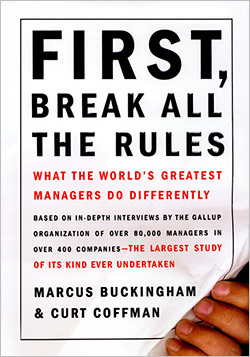 We continue our examination of the business book First, Break All the Rules with an interview of author Marcus Buckingham. Why did he write the book, and why are managers more important than leaders? What was the impetus for you to write First, Break All the Rules? My job at Gallup had been to build selection interviews for people who were excelling in particular positions–everybody from housekeepers to leaders. And one of the jobs that many companies ask to build interviews for is managers. We had literally hundreds of thousands of recorded interviews of great managers, talking about what they do differently. And a comparison group of managers who were less effective in these companies talking about what they did. So one of the impetuses was just a huge amount of research, what amounted to 80,000 interviews of great managers from a variety of different industries. The second piece of impetus is when you look at that research, you actually find that great managers are not doing what everybody says they should do. They are not focusing most time on fixing people’s flaws; they are not selecting people based upon skill and experience; they do not keep their distance from people; they do not treat everyone the same. A lot of the rules of conventional management wisdom seem to have been broken by these great managers. I think most business books before that time were written as personal histories. They were books about individual leaders who had chosen to describe their own experience as a leader or as a manager. At the time, in the late 80s, Donald Trump’s book was very big, and Jack Welch’s books and Rudy Guiliani’s book. What no one had really done though was systematic research: lets not talk to these glamorous CEOs and hear their story; lets go talk to the people that actually made the companies run, the people in the middle management roles through which all company focus and culture is actually fed. What are the most dangerous pitfalls of being a manager today? One of the biggest challenges in managing today is they don’t value face time any more. The true genius of a great manager is his or her ability to individualize. A great manager is one who understands how to trip each person’s trigger. And they figure that out through their relationship with the person, through their exposure to the person, the verbal and non-verbal clues they see, psychological cues and physiological cues; they figure out how to focus this person, how to reward this person, how to engage this person, how to challenge this person. These days, with email and with texting and with the rise of virtual employees or remote employees, the biggest challenge is that managers don’t know their people and they think they can manage through email, and manage through text, and manage through virtual arrangements. And they can’t. Things like a results-only work environment are all very well, but it’s a very rare individual who can understand the uniqueness of person and how a person is driven or how a person thinks or how a person is motivated when you don’t actually get to see a person face to face. We think all these new technologies increase productivity and performance, but they don’t. They drastically decrease the effectiveness of a manager to help that person be productive. The zeitgeist tells us you can do it all remotely, you all can work from home–technology is going to free us up from actually ever having to be in the same office at the same time. You can’t shortcut it. It’s like saying, “Chess is really hard; all the pieces move differently.” What’s the alternative? You can play checkers, if you want–but then you are playing an easier game. But the problem is that you got ten sales people reporting to you–but they’re not ten salespeople, they are ten individuals who happen to be in sales. You can’t generalize. You have to figure out how to get the most out of them one by one. Like a chess game, you have to figure out the moves. They each move differently and they don’t wear that tattooed on their foreheads. You can’t shortcut that understanding. The book’s subtitle mentions Greatest Managers–who are the greatest managers you have met? No one would know their names. These are people deep within organizations. We put such a premium on Leadership, that we think that managers are just leaders in waiting. And the very point of writing First is saying “No, no, no, no, no.” What makes companies strong are great managers. We need very few leaders. A leader rallies people to a better future, by tapping into what everyone share. A manager turns a person’s natural ability into performance–and he or she does that, not by tapping into what everyone shares, but by tapping into what each person has that’s unique. That’s a very distinct function and role. So the purpose of writing First was really to almost rehabilitate managers and to say, “Managers are really, really important. Forget leadership.” You don’t need leadership–I mean you do. But this is the first book we said that people join companies, but then they leave their boss. In the intervening ten years we have seen a lot of people say that. I am sure I was not the first person to write that, but I was the first person to draw a spotlight on it. You quit your boss. If you have a performance problem, it’s a manager problem; if you have a quality problem, it’s a manager problem; if you have a turnover problem, it’s a manager problem. Great managers make strong companies. And so the people who I think are great managers are people whose names you wouldn’t recognize: a housekeeping supervisor at the Los Angeles Airport Hampton Inn, or manager of Store 531 at Walgreens, the manager of trend and product department at Kohl’s, the leader of group 50 engineers at Facebook–these are people who are measurably massively outperforming their peers. It’s one of the reasons I am drawn to companies in retail or banking, because you can so easily compare manager to manager to manager. You go to a company like Best Buy, you have all these big boxes with these measurements attached to these stores, so you can really see the impact of one manager, versus another, on the productivity of two teams doing exactly the same work in the same company. How has your process changed from First, Break All the Rules to writing Find Your Strongest Life? There are two main things when I try to write a book. If I see something in the data, that I think is an anomaly, then I want to write a book about it. With First, we did all this research with these managers and what they were saying was not what was being written about. In terms of The One Thing You Need to Know, what is the difference between managing and leading–and not in the way that puts managers under the leaders. Let’s be articulate about that. In terms of Find Your Strongest Life— I wrote that book because there’s this pattern in data showing happiness in men compared to women, which no one was writing about at the time. Women’s happiness over the last 40 years shows a gradual, but significant decrease in life satisfaction, as compared to men’s, which shows a gradual but significant increase in life satisfaction. 40 years ago women were happier then men, and now they’re unhappier. I hadn’t seen a single book written about that, and I was intrigued by that. So my process always begins by looking at pattern in data and going, “What on earth is going on?” And then I try to figure out. In the case of Strongest Life, lets interview people who have bucked the trend, women who are becoming more fulfilled and more engaged. What are they doing differently? In the case of First, it was clear there are managers who are doing a brilliant job of engaging their people–how do they do that? I love interviewing people who have figured something out that I haven’t. At the time I wrote Strongest Life I did a bunch of presentations and people would say, “What would you know about this, you’re not a woman.” And I said, “You’re right. I was just writing about these women we interviewed, just capturing what they said.” At the time I wrote First, people would say, “Are you great manager?” And I would reply, “Well, No. What I’m writing about in First, isn’t what I think–I’m actually not a very good manager. I’m too absorbed in my own thinking to be a good manager. But First is trying to capture what other people are saying, people who are good managers.” I think my process there remains the same: interview people who are really good at what they do and try to capture it. What makes a good business book stand out from all the others? I think a good business book has one coherent idea that is richly played out. In the case of First, it was managers make the difference; what makes a good manager? Managers are more important than leaders; managers are more important than culture; managers are more important than values; your manager makes all the difference; what makes a great manager? Let me play that out of you. Good to Great? How do you go from good to great? That’s one straightforward idea that is compelling. I want to see you play that out. Made to Stick–why do some ideas survive and others die? Okay, that’s a really straightforward question. So what makes a great business book is about a compelling question that I dearly want to know the answer to. I think Good to Great is a really good book–I don’t agree with everything in it, but it’s a great book. People think Jim’s talent is research; the research is backwards, actually. You can’t do what he did, start with a premise and then do research to back up the premise. What he’s brilliant at is capturing a concept in a way that’s a metaphor that lasts with you. His question is great, and the concept like the Flywheel is a great metaphor. So Good to Great: A. brilliant title, and B. great metaphors. The second one would be In Search of Excellence. I would go all the way back to Tom Peters; that is a diligent study. It was a time when everyone believed that every American company was terrible and all the best companies were Japanese. When you go back and read it right now, it’s a pretty tough read–some parts are really quite philosophical. Before I wrote First, I sat in a hotel room in Hungary for a week and just read In Search of Excellence again and again. I wanted First to do for managers what In Search of Excellence had done for companies. The last one would have to be The Tipping Point. Malcolm Gladwell is a beautiful writer. I think Blink is conceptually a little incoherent; I think Outliers is just wrong in parts; but both of them are beautifully written. The Tipping Point is not only beautifully written, it’s just conceptually coherent and really practical. I don’t think it gets much better than that. And a great question–why do certain ideas get to a point where they spread and spread and spread? I want to know that immediately. His answer is so beautifully told and so applicable. You don’t come away going, “That was kind of interesting, but I don’t really know what to do that.” With every one of these three books I think you come away going, “I know what to do.” So I would put those as my top three, with all apologies to Peter Drucker–the guy is a genius, but I don’t think he’s as beautiful a writer as Gladwell, I don’t think he’s as good with metaphor as Collins is, and I don’t think he had the inspirational focus the way Peters and Waterman did. 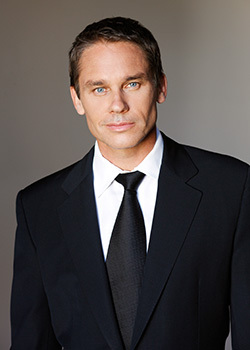 Marcus Buckingham is the coauthor, with Curt Coffman, of First, Break All the Rules by Marcus Buckingham and Curt Coffman. Read more about First, Break All the Rules or from our Leadership Hall of Fame.